Apple has always been a leader in the use of automated systems in the production and distribution of their computers. 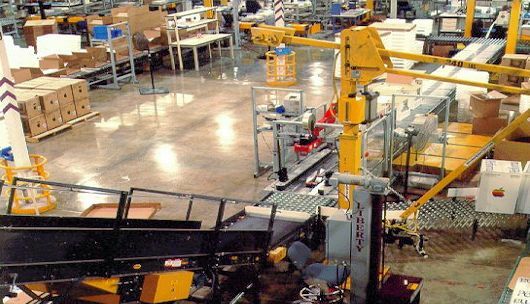 This manufacturing and distribution system was designed for 24 hour per day operation with a throughput of 20 cases per minute of 15 different models of computers. Once the products are received from manufacturing, they are automatically handled by the system through the case taper, scanning of product type and subsequent sortation by product type prior to palletizing. Once a full pallet load of cases are accumulated, they are released to the palletizer and transported on slip sheets to the warehouse. 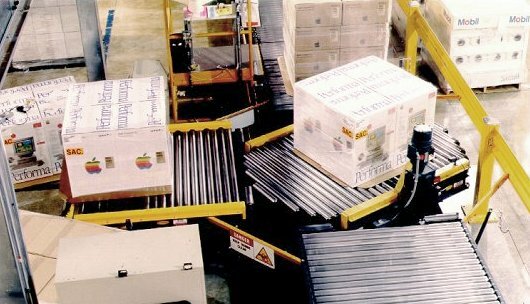 Certain situations call for the palletized load to retain orientation on the conveyor, which is why FloStor engineered and fabricated conveyor turntables for the products to be diverted for early shipment or audit prior to being transported to the warehouse. This system was designed to minimize intervention or constant monitoring. Through controls and PLC's, when a fault condition is detected, the PLC will automatically page a maintenance person to correct the problem.